It's flexible and looks the part, but can it deliver the goods? Lenovo went all out to make sure that the Yoga 3 Pro wasn't going to be an incremental upgrade, which wouldn't have necessarily been a bad move. The Yoga 2 Pro was an all-round impressive machine that packed plenty of power under the hood while being one of the first ultrabooks to come with a gleaming 2K display. The Yoga 3 Pro's screen is every bit as sharp and once again flips around 360-degrees into four usage modes: laptop, tend, stand and tablet. However, Lenovo has chosen to place a greater focus on design this time around, switching to Intel's Core M processor in a bid to give its latest 2-in-1 catwalk-thin dimensions. Originally launched at the beginning of the year, it sits a penny short of a grand for the entry-level model that comes with 256GB of flash storage. A second configuration doubles storage for £200 more, but the differences stop there. Both feature Intel's Core M processor, a 13.3-inch display, 8GB of main memory and Windows 8.1, which is now upgradable to Windows 10 for free. The Yoga 3 Pro is often subject to various cashback deals if you shop around, with one currently offering to return £200 to your bank account if you buy directly from Lenovo. Laptop makers often claim that their designs are unique, but the Yoga 3 Pro is genuinely different to anything else out there. HP's Spectre x360 is an attractive and better built laptop, but the Yoga just feels that bit more luxurious thanks to its watchband-style hinge. 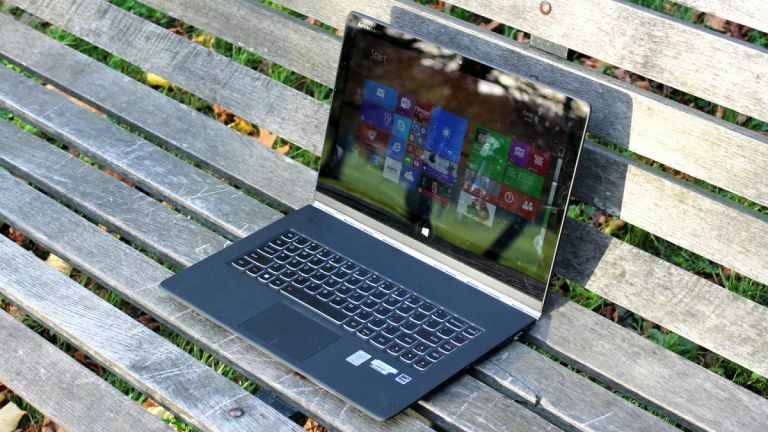 That's right: the Yoga 3 Pro's standout feature is a hinge. Crafted from 800 individual pieces of aluminium steel, it's luxurious to boot and even sounds expensive, making the sort of clinking noise that usually comes from the wrist of a fine-jewellery connoisseur. The hinge matches the Yoga 3 Pro's silver lid, which bears Lenovo's logo on the top-right hand side. Opening up the laptop reveals a décor that's almost as impressive, featuring a rubbery patterned base and ThinkPad-style keyboard. Like most 2-in-1s, the black bezel that surrounds the display is a little chunky, which is done on purpose to make sure your hand doesn't accidentally catch the screen when holding it in tablet mode. Even so, it feels excessive in light of the Dell XPS 13's Infinity Display, which is surrounded by a screen bezel that's just millimetres thick. Lenovo has tried to squeeze as many features into the Yoga 3 Pro's thin dimensions, with mixed success. The company cut down on the number of ports to achieve the device's thinness, but the situation isn't as bad as the 12-inch MacBook's single USB Type-C port. On the left-hand side is a USB 3.0 port that doubles up as a charging port. It's positioned alongside a full-sized SD card connector, in addition to micro-HDMI for hooking up an external monitor. Communication is taken care of through 802.11ac Wi-Fi and Bluetooth 4.0. At 2.62 pounds the Yoga 3 Pro is 14% lighter than the Yoga 2 Pro and weighs less than the 13-inch MacBook Air's 2.69 pounds. At 12.7mm it's one of the thinner laptops out there, but its svelte dimensions come at the expense of build quality in certain areas. We detected an uncommon amount of flex in its lid, and pressing at its base revealed a similar amount of bend. Forgivable in lower-spec laptops, we would expect something a bit more solid in a premium flagship offering. The Yoga 3 Pro's 720p webcam produces clear video and images that are sufficient for Skype calls and Google Hangouts. Speakers are worse, not only producing low volume but erring on the tinnier side of tinny. Headphones are recommended. The Yoga 3 Pro is one of several new thin-and-light laptops sporting Intel's Core M processor, which can also be found in Apple's 12-inch MacBook and the Asus UX305. Unlike those machines, the Yoga isn't fanless, so you'll hear the fans whirr up now and again when the processor is placed under heavy load. Core M was necessary for Lenovo to give the Yoga 3 Pro its thin dimensions, but this comes at the expense of raw power. When the Yoga 3 Pro debuted, we found it to be slow and unresponsive when attempting to use more than 10 applications while having multiple browsers, each with several tabs open, at the same time. Lenovo appears to have acknowledged this by swapping the Intel Core M5Y70 processor in the original model for a newer Intel Core M5Y71, which boosts clock speed from 1.1/2.6GHz to 1.2/2.9GHz. While we haven't tested the version with the newer chip to certify that it's faster, it's certain that the 300MHz increase in maximum clock speed won't do the newer Yoga 3 Pro any harm. General performance isn't the Yoga 3 Pro's only problem - it also suffers from average battery life. Our light use battery test - which saw us browse the internet, hold a few Skype calls, watch YouTube and edit documents - saw the Yoga run for just over seven hours. That was with the brightness set to 75%, a setting that was slightly too dim for comfortable interaction - so expect it to run for even less time at full beam. As mentioned, the Yoga 3 Pro can rotate into five different positions depending on how you want to interact with the contents on the responsive touchscreen display. Laptop mode is self-explanatory, and tent allows you to fold over the display in an inverted “V” shape which comes in handy for watching videos or movies in cramped places – such as a train or in the bath. Folding the display over 180-degrees allows the tablet to be used in tablet mode, which automatically flips screen contents around to suit your orientation. Although this technically allows it to be used as a tablet, at 13 inches the Yoga 3 Pro is bigger than your average tablet which makes it unwieldy to use in this mode. The Yoga 3 Pro's keyboard is a pleasure to type on in laptop mode thanks to its ThinkPad-shaped keys that produce just enough travel for comfort. Though a little on the small side, the trackpad is responsive - just make sure you have a cloth to hand for wiping away fingerprints. Whichever mode you're in, the display's pixel-resolution of 3200 x 1800 makes everything appear sharp and clear when used at a 125% or 150% magnification setting in Windows. Using the desktop at 100% provides ample room for productivity tasks but renders text and images too small to comfortably read. The Yoga 3 Pro remains an impressive accomplishment in design. It's thin and light and catches the eye in a manner that few laptops can thanks to its watchband hinge-style. The problem, then, partly lies around Lenovo's switch to Intel's Core M processor. Its inclusion in the Yoga 3 Pro allows it to be thin, but like Apple's 12-inch MacBook, it comes at the expense of raw power. Added to (in parts) poor build quality, shoddy speakers and battery life that has you constantly fearful of running out of juice, the Yoga 3 Pro's eye-catching design soon loses its allure. If you're specifically seeking a 2-in-1 device, HP's Spectre x360 even and Lenovo's own Yoga 2 Pro are much more capable machines – and if you shop around they're cheaper too. The risk is that they won't go as far to satisfying your expensive taste.